The original Wojan-Cashman Map of Beaver Island was printed in 1977. The new updated 2013 third edition Wojan-Cashman Map and visit guide of BEAVER ISLAND is a must for visitors. This useful geographic work of art makes a great trip memento or gift. The beautiful 19” x 28” Full Color map is suitable for framing. This is a complete detailed map of Beaver Island with great new visit information on the back. 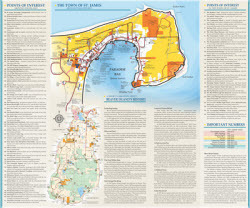 This is “the map.” It features roads and trails around the Island, topography, private roads, a detailed legend, nature preserves. Valuable features includes lake depth, topography and number & letter codes along the edge that allow easy location descriptions like, Whiskey Point is found at 12-C. Public and private land is clearly marked. The visit information on the back includes points of interest, a town enlargement, important phone numbers and a brief summary of Beaver Island History. 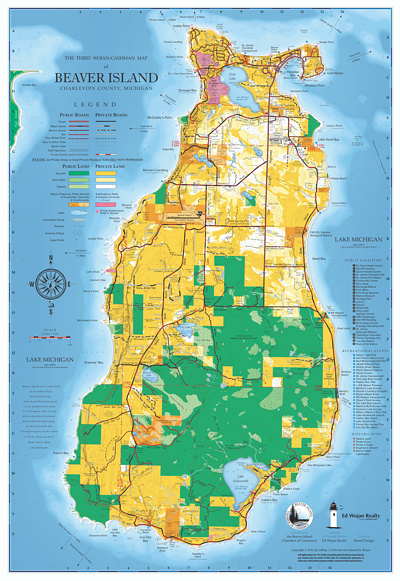 You can purchase a high-quality Beaver Island Map direct from the Chamber of Commerce. Please mail us your name and address, along with a check for $7.00. We will send your map(s) promptly. 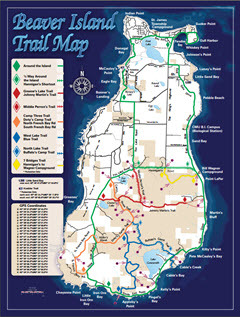 You can download and print this Beaver Island Trail Map. It features several popular trails. Some GPS coordinates are included to provide location assistance in off road areas. This is a pocket type map of popular trails, not a complete road and land use map like the Wojan-Cashman map.